Captain Mong is a native of Huey, Pennsylvania. He graduated from Grove City College in May 1989 with a Bachelor of Science degree in Electrical Engineering and received his commission at Naval Officer Candidate School in Newport, Rhode Island. He received his Master’s degree in National Security Strategic Studies from the Naval War College in Newport, Rhode Island. Captain Mong’s at-sea assignments included a division officer tour on USS HENRY M. JACKSON (SSBN 730)(Gold), a department head assignment on USS MIAMI (SSN 755), an executive officer assignment on USS ALEXANDRIA(SSN 757) and a command tour on USS HYMAN G. RICKOVER (SSN 709). During his division officer tour he completed seven strategic deterrent patrols, as a department head he conducted a CENTCOM/EUCOM deployment and during his executive officer assignment he deployed “around the world” on a combined ARCTIC/WESTPAC/EUCOM deployment. As Commanding Officer, USS HYMAN G. RICKOVER (SSN 709), he completed a Decommission Inactivation Availability at Portsmouth Naval Shipyard in Portsmouth, New Hampshire. On shore-duty, Captain Mong was assigned as the Tactical Products Officer at SUBMARINE DEVELOPMENT SQUADRON TWELVE, department head on the SUBMARINE TACTICAL READINESS EVALUATION TEAM ATLANTIC and the Deputy Commander for Readiness at SUBMARINE SQUADRONS TWO, FOUR, and TWELVE. His post-command tours included Deputy Chief for Joint Security Office Forward on the staff of U.S. CENTRAL COMMAND and Director of Training at NAVAL SUBMARINE SCHOOL. 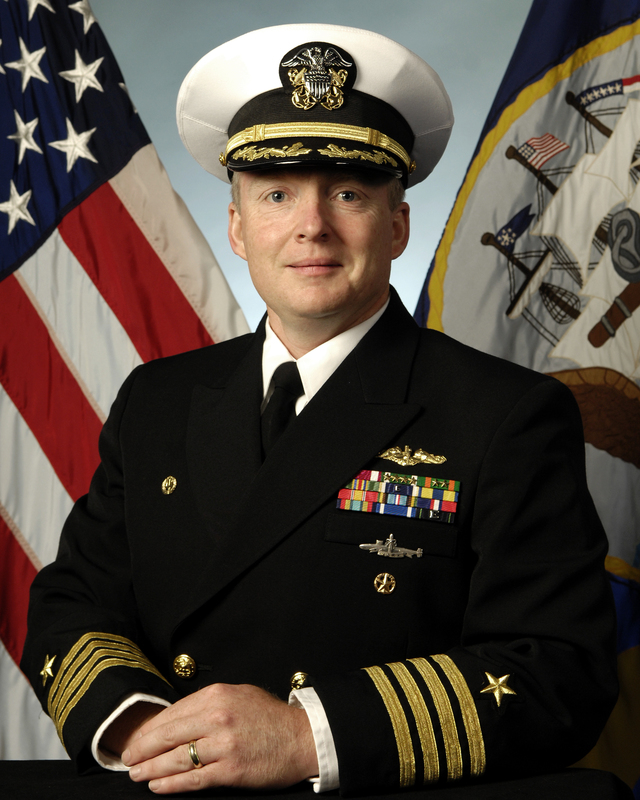 Captain Mong most recently served as Commanding Officer of the Naval ROTC unit at Purdue University. In October 2015, Captain Mong took command of the Naval ROTC Maryland Consortium (UMD/UMBC) and assumed duties as the Professor of Naval Science. Captain Mong has been awarded the Legion of Merit, Meritorious Service Medal (3 awards), Joint Service Commendation Medal, Navy and Marine Corps Commendation Medal (7 awards), Navy and Marine Corps Achievement Medal (3 awards) and various campaign and unit awards including Battenburg Cup and Battle Efficiency ‘E’ awards. 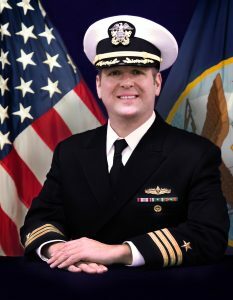 A native of Cape May, New Jersey, Commander Stephen M. Kosloski graduated from the United States Naval Academy in 1997 with a Bachelor of Science degree in Oceanography. Following his sea tours, CDR Kosloski earned his Master of Arts at the U.S. Naval War College in Newport, RI and completed Joint Professional Military Education (Phase I). He completed Joint Professional Military Education (Phase II) at the Joint Forces Staff College in Norfolk, VA and is a fully qualified joint officer. Ashore, Commander Kosloski completed his Executive Officer tour as the Chief Staff Officer for Coastal Riverine Squadron Eleven in Seal Beach, CA. During this tour he deployed to the Arabian Gulf as Security Force Mission Commander in the Port of Jebel Ali, United Arab Emirates. He then served as the Commanding Officer of Naval Operational Support Center in Avoca, PA. His most recent tour was as part of the United States Military Training Division to Saudi Arabia as the Deputy Chief and Operations Advisor for Naval Forces Division. CDR Kosloski has served as the Executive Officer of the NROTC Maryland Consortium since January 2019. Afloat, Commander Kosloski completed his division officer tours aboard the destroyer USS RUSSELL (DDG 59) as the First Lieutenant and Training Officer and then aboard USS LEYTE GULF (CG 55) as the Assistant Engineering Officer. He completed his department head tours aboard USS CHAFEE (DDG 90) and USS BUNKER HILL (CG 52) as the Chief Engineer. During his sea tours he made two deployments to the Arabian Gulf in support of Operations Iraqi Freedom and Enduring Freedom. He led the Engineering Department on BUNKER HILL during that ship’s Cruiser Modernization period, upgrading the propulsion plant from analog and steam systems to “Smart Ship” digital and electrical systems. Commander Kosloski’s personal awards include the Navy and Marine Commendation Medal (8 awards), the Navy and Marine Corps Achievement Medal (3 awards), Defense Meritorious Service Medal, and multiple unit and service awards. He is married to the former Natalie Mitchell of Melbourne, Australia with one child.